Please take a few moments to read the following very helpful and frequently asked questions and answers. Be sure to have your cosmetic permanent makeup performed by a licensed professional. Below, I have revealed my credentials, my techniques and inks, so you can feel rest assured about your treatment. * I am highly qualified and trained and hold certification in Advanced Correction & Camouflage as well as Advanced Permanent Cosmetic Makeup including microblading (aka microstroke or 3D stroke or fetherstroke) techniques. Read more about these techniques below. * I use both a state-of-the art rotary machine which is gentle, quiet and offers pre-sterilized parts and disposable needles. In addition, I use a specialized hand tool and premium grade microblades for superior, natural results. Microblading is without a doubt, the most authentic and natural method of achieving natural-looking brows. This technique is used by the best permanent makeup artists in the world. The rotary machine is best for lip liner and full lips. Both techniques are available at two locations in Los Angeles/Marina del Rey and in Brentwood, CA. * Call Louisa at 310-990-2704 to schedule an appointment at the location that suits your needs. NOTE: A 48 hour cancellation policy is required. 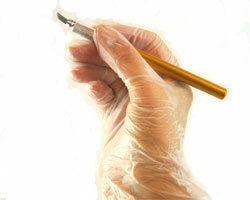 * For your safety, I use only sterilized equipment and disposable needles, and the highest, premium quality USA-made pigments that are both hypo-allergenic and FDA-Approved. Consultations are free by phone. Simply text a close up photo of your brows or lips to 310-990-2704 and I will be in touch to discuss the procedure and fee. If you wish to have an in-person consultation, we do so at my spa in Marina del Rey and the fee is $25. However the $25 fee is deducted from the cost of the procedure should when you book your appointment. Microblading – Hand Tool method using 7- 17 microblade needles (aka 3-D, micro-embroidery or featherstroke). Microblading offers THE most real-looking natural hair strokes for eyebrows. Rotary Machine – is used for permanent makeup for lips. Are permanent makeup and microblading procedures painful? Microblading for brows is virtually pain-free as we numb the brow area with our premium grade, highly effective topical anesthetic cream and gel, applied before and during the procedure. For lips we use a rotary tool which is a different procedure than microblading and may cause very minor discomfort. However, we re-apply numbing to ensure comfort. Some individuals report that the sensation feels like a vibration or light scratching. To minimize any discomfort we apply our premium topical grade numbing anesthetic cream / gel on the lips before and during the entire procedure. Many of my clients remark that their lip procedure was far more comfortable than they anticipated. Scrub the brows the night before your procedure using a facial scrub product or some baking soda on wet skin. After rinsing apply moisturizer. If you desire permanent makeup on your LIPS, and are prone to fever blisters, cold sores or Herpes I on the lips, we recommend that you take Valtrex as follows: Take 1000 mg. the day before, 1000 mg. the day of your procedure, and 1000 mg. the day after your permanent makeup lip treatment. Check doses with your doctor. If you do not have access for Valtrex, you can purchase over-the-counter Abreva at any drug store. Also scrub the lips the night before your procedure using a facial scrub product or some baking soda. After rinsing, apply some lip balm or vitamin E.
Most people are amazed at how “normal” they look immediately after each procedure. Eyebrows rarely swell or get red but will require ointment applied 2-3 times a day from Day 1 to Day 10. DO NOT apply bandages over the pigments. Following a LIP procedure, there may be mild swelling, bruising, redness, or tenderness that lasts a few hours to a few days. We provide a numbing lip stick that helps during aftercare and recommend applying ice immediately after the procedure. All clients are given an aftercare sheet with simple, detailed instructions. Your aftercare instructions are extremely important. I will explain in this in person AND provide instructions on a printed page after your service has been completed. Aftercare is easy and will prevent any infection provided you follow exactly the simple directions. Permanent makeup colors should be selected to compliment a person’s skin tone, hair, and eye color. A conservative approach is best because it is easier to make an existing color darker versus lighter in your follow-up appointment. Colors will always look darker and more intense immediately following a procedure (up to three days) then on the fourth day, they will lighten at least 40- 50%. Then over the next 10 days to 4 weeks, the color will gradually lighten and soften. Please allow 4 weeks BEFORE any touch-up treatment. Because we created small openings in the skin using needles, the brows or lips will become temporarily darker due to the “flush” of blood flow to the area during the permanent makeup process. Some report that their brow strokes look very dark – but do NOT panic – within ONLY 3-4 days, the strokes will lighten back up to the original color. For LIPS, the color may peel and within day 3-4 days, and may even appear like the color has faded away. But then within 14 days, you will see all the pigmented color reappear and your lips will look marvelous for many years. Many important steps are followed when a procedure is done correctly. A well-trained and experienced permanent cosmetics specialist will take a minimum of 3 to 3 1/2 hours for an initial appointment to do microblading or permanent makeup on the lips. During that time the area will be numbed. Then both the client and technician will determine the best design, color and shape of your brows or lips. Close-up photos of the brows (or lips) will be taken before the procedure, then the pigment will be applied. Laslty, aftercare is explained. Can microblading cover old style solid tattoos of the past? If the brows are faded light enough, I can add microblading strokes to cover the old, solid tattooed brows. Text a photo of your bare brows so I can review them to determine if microblading can cover the old tattooed brows. Color retention is affected by different factors including the shade of the original color, the person’s age and metabolism, skin type and condition, exposure to UV radiation (sun exposure, tanning booths), smoking, certain drugs and medications, and skin peeling treatments such as AHA’s, Retin-A or microdermabrasion. In general, the color lasts from one to three years and can be enhanced and refreshed by a maintenance visit when needed (usually at a lower fee than the initial procedure when performed by the original artist). I charge only $125 – $200 to touch up brows. During the initial procedure, the area(s) of treatment will be numbed and color will be applied to re-saturate the area. Sometimes, there may be an area where the tissue will not allow more pigment to be implanted. No worries! Those areas will show less color after healing and may likely need another visit to be filled in. This is called a touch-up appointment. A small touch-up fee will be discussed and agreed up by both parties before your appointment. Once your desired results are achieved, a maintenance visit should be booked every 2 years or less. Keeping your face protected from the sun will help maintain your pigments. Wear sunscreen when outdoors. 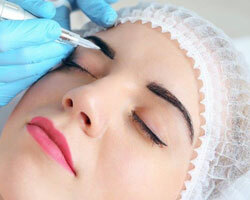 The removal of permanent makeup is not an easy process, if at all possible. 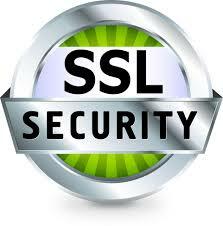 That is why it is important to select a qualified and experienced professional who has a conservative approach. During the initial application, a “less is more” philosophy works best. A lighter, more natural color can always be changed or supplemented later with conventional makeup or can be adjusted or darkened if necessary with another application at a second (touch-up) appointment. Shape can also be refined at a follow-up visit, but not drastically, so a good original design is a must. Will Permanent Makeup and microblading continue to look good as I age? With age, our skin and elasticity changes. However, there are many older women who look good wearing conventional makeup as long as it is correctly applied. Those women would look just as good with correctly applied permanent makeup. The best looking permanent makeup can be altered, however, if any facial surgery is performed, that may change the position of the tattooed area. For example, if a brow lift is performed after a permanent eyebrow procedure, the eyebrows could be raised and look different. Therefore, anyone planning to have facial plastic surgery should do the surgery first, and then do permanent cosmetic makeup. Yes. Magnetic Resonance Imaging (MRI) uses radio waves and electromagnetic fields to create pictures of internal human organs. The magnetism and temperature changes during these procedures may cause mild temporary discomfort (mild burning sensation) in BODY tattoos containing large amounts of iron oxide metals. However the amounts of iron oxides in brow, eyeliner and lip permanent makeup is much much less than for body art tattoos. Studies showed that only a few patients with an iron oxide tattoo reported a mild pulling or burning sensation during an MRI test. Most people with tattoos have had no problems. The size of a tattoo and the total number of tattoos seems to affect the amount of magnetic pull. According to MRI safety experts, the iron particles in most cosmetic tattooing pigments are too microscopic to react as metal pieces. However, they recommend that a patient with a tattoo (body or face) should inform their radiologist and technician where it is located because it may create a small artificial image. Please be sure to inform your technician BEFORE coming to your appointment if you are prone to fever blisters, cold sores or herpes on your lips. She will advise you to take a special medication that will help hinder a breakout, but you must take it a few days before your procedure. Am I a candidate for permanent makeup if I am diabetic, have HIV/AIDs or Hepatitis? Please be sure to inform your technician BEFORE coming to your appointment if you have either HIV, AIDS, or hepatitis B or C and she will advise you. Please read the testimonials page for comments from many satisfied individuals about my artistry, skill and affordable pricing. My goal is to help women look their best without breaking the bank. Permanent cosmetics are affordable for most people, and the long term benefits make procedures fairly inexpensive. Other non-surgical procedures like Botox or fillers cost the same or more. 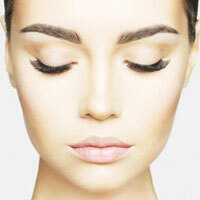 But they may last for only three to six months while cosmetic permanent makeup can last for years. Many clients agree that the savings from not having to buy regular makeup products, the time saved by not having to apply makeup, enhanced features and increased self-esteem, makes permanent makeup priceless. Price also depends on the city and availability of the treatment. See our Before and after photos on the Photo Gallery page to help make your decision.